I am a BzzAgent and I LOVE it! I get to try all kinds of cool products and coupons and all I have to do is share my honest opinion with the panel and other people. If you want to learn more about becoming a BzzAgent, just click HERE. 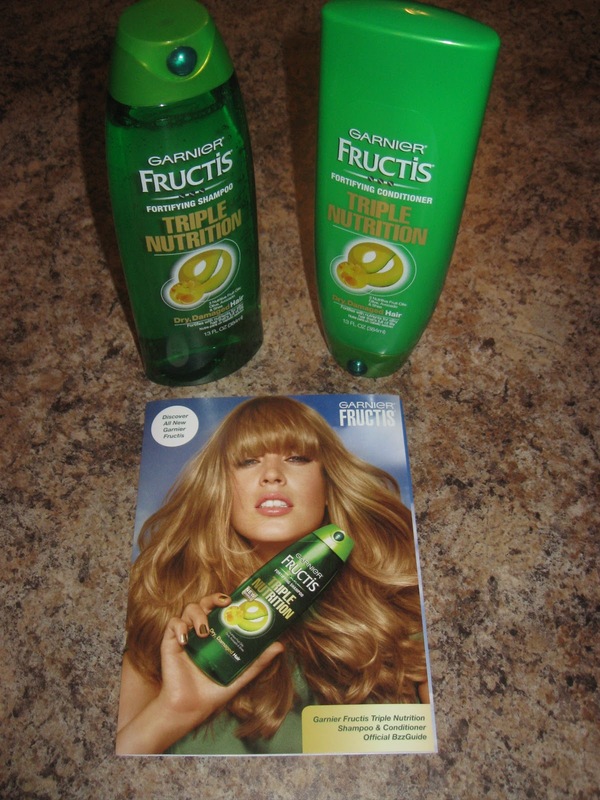 The latest product that I got to test out was Garnier Fructis Triple Nutrition shampoo and conditioner. As you can see, I got two full size bottles! I was SO excited. I have to admit that prior to this campaign, I was using generic shampoo and conditioner. We’re trying to save money and I’ve found that the store brand isn’t much different than the brand names. After trying Garnier Fructis, I might have just changed my mind. One of my favorite things about this product is the smell. It smells wonderful! It’s like a green apple scent. Yummy! I also have to say that after just a couple of days, my hair was noticeably softer. I also noticed something that others might not notice, and that is the different shapes in the bottles. For people with my mom who have poor eyesight, I think it would be a great help to have the shampoo and conditioner bottles shaped differently. This way you can just feel the bottles instead of having to read which one is which. I have very fine hair. I love that this product doesn’t weigh my hair down, but you have to rinse very well after using the conditioner because it goes on pretty thick. The only negative I have is that after using the product for about a month, I feel like I need a change. This is a problem that I have yet to solved though. Because of my fine hair, I just have to change it up for a bit. Even though I’ll change it for now, I do plan to come back to the triple nutrition. Maybe the BzzAgent sight will have something else for me to try that will solve this problem! ;0) I give Garnier Fructis Triple Nutrition 4 out of 5 stars!